PET-Austin received the GuideStar Exchange Bronze level logo, a leading symbol of transparency and accountability provided by GuideStar USA, Inc., the premier source of nonprofit information. The logo demonstrates PET-Austin’s deep commitment to nonprofit transparency and accountability. In order to be awarded the GuideStar Exchange logo, PET-Austin had to fill out every required field of our nonprofit report for the Bronze level of participation. We hope you will check us out and tell us what you think: http://www.guidestar.org/organizations/27-0549926/personal-energy-transportation-austin.aspx. When you get to the web page, just above the GuideStar logo is a bar with buttons and an > on the right side. If you do not see the 'Reviews' button, click the > until you see the 'Reviews' button. Write a review of what you think about PET-Austin and what our efforts and goals means to you. This will help us when foundations throughout the country are searching GuideStar to identify charities they would be interested in supporting. AmazonSmile is a simple and automatic way for you to support PET-Austin every time you shop. 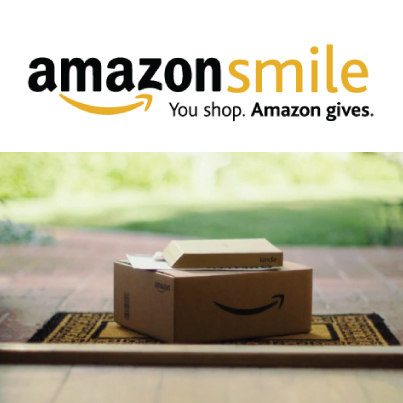 When you shop at smile.amazon.com, you’ll find the exact same convenient shopping experience as Amazon.com, with the added bonus that the AmazonSmile Foundation will donate 0.5% of your purchase price to PET-Austin. In fact, if you already have an account with Amazon, your login, password and everything else is the same. The first time you go to smile.amazon.com you will be asked to select a 501.c.3. Enter Personal Energy Transportation of Austin in the charity search window and our name will pop up in the list. Select us and go from there. Be sure to set smile.amazon.com as a favorite so it will be easy to get to every time you shop and help us build more PETs to deliver the Gift of Mobility. 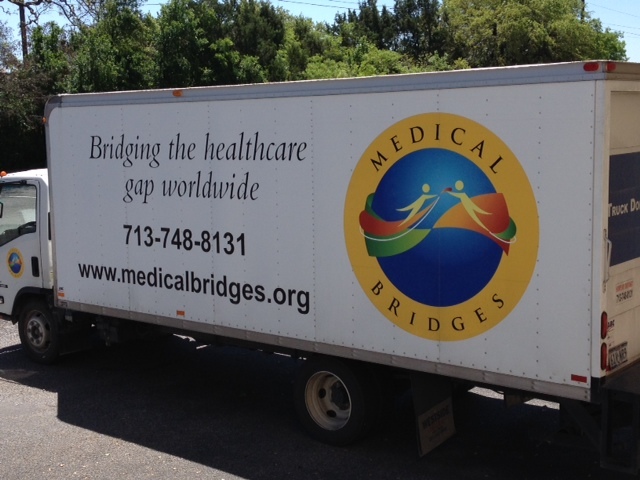 PET partner, Medical Bridges Houston, TX, picked up 36 PETs that will be included in their shipments of medical supplies going to missions around the world. Hopefully this is the first of many future shipments with this partner. 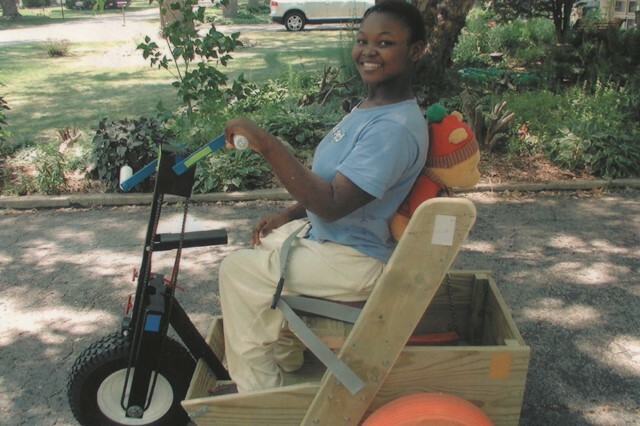 In 2005 Dr. Tina Slusher, Louisville, KY, brought Suen Oke (pronounced Shay-une O-key) from Nigeria to Louisville for special surgery. 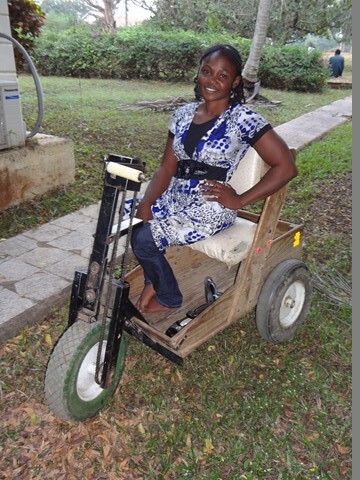 The surgery was successful, but Suen had polio, not curable. Tina asked for a PET for Suen and PET-MO supplied. Suen rode it into the airport and took it back to her village. Suen rode her PET all the way through highschool. About 3 years ago a group of Baptists in Texas called and wanted to take new rear wheels to Suen. She was ready to go to college and the rear tires needing replacement. This fall, PET-International is bringing Suen to the States to attend the PET Annual Conference and an International Disabilities Conference. While she is here, she will tour the States visiting various Affiliate locations. Texas has been selected for one of her stops. While here she will be visiting with the PET-Austin, PET-Brazos Valley and PET-San Antonio Affiliates. She will base out of Austin while here and will participate in the Bethany UMC Mission focus weekend October 25 – 26. The photos show Suen when she got her PET in 2005 and her in the rebuilt PET in 2013. We are looking forward to her visit. More information will be coming out in our future newsletters and here on our web site as it becomes available. One of our volunteers, Tom Perkins, was one of the 2013 RecognizeGood Legends. The Legends program is a monthly award designed to recognize a community contributor, or Legend, who embodies the core beliefs of RecognizeGood through his or her extraordinary charitable actions. The monthly Legend may choose a registered nonprofit to receive a Pay-It-Forward donation through RecognizeGood. Tom chose PET-Austin and PET received a $1,000 donation in November. Each January RecognizeGood has a "Say Thanks Austin" campaign to allow the community to express their gratitude by voting for Legends on the RecognizeGood website. The Legend with the most Say Thanks votes may again choose a nonprofit to receive his or her $10,000 Pay-It-Forward check. This year Tom placed third and PET-Austin received $1,500 as a result. Just as we did with the first $1,000 donation, the $1,500 check will go into our building fund for the new building that hopefully will be constructed toward the end of this year or early next year. Thanks so much to everyone that voted for Tom and PET-Austin. PET Austin is off to a great start for 2014. 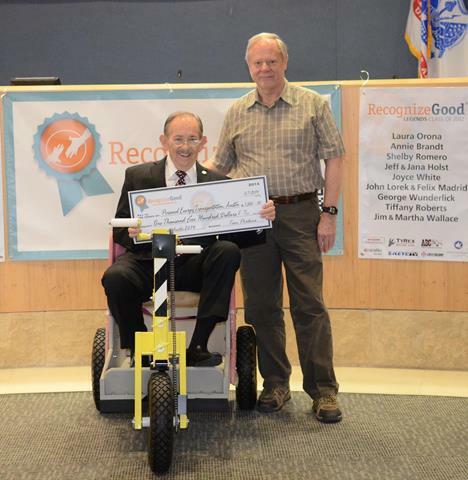 Last year volunteer Tom Perkins was selected by RecognizeGood as an Austin Legend for his contributions of efforts and time committed to the community. With that recognition Tom was able to select a charity to receive a $1,000 donation from RecognizeGood; Tom chose PET Austin. Each January, RecognizeGood has a "Say Thanks Austin" campaign and all of the legends of the previous year campaign and receive votes of thank your from the community; in 2013 there were nine legends. The legend with the most votes receives $10,000 for their designated charity. Second place receives $2,500, third place receives $1,500 and the other legends all receive $500 tor their charities. So in addition to building PETs, we spent a lot of January campaigning for Tom. We will know the results on February 21 when the winners are announced at the RecognizeGood awards ceremony that will take place at Austin City Hall at 11:00. On February 4, we shipped twenty PETs to the Lion’s club in Del Rio, TX who then coordinated the delivery to the Acuna Host Lion’s Club in Acuna, Mexico. We are currently putting together a thirty-six PET shipment that will go the Medical Bridges in Houston to be distributed in various medical shipments to mission organizations in many locations. Be sure and be looking for our next newsletter that will be coming out this month. If you are on our email list you will receive it by email, or you can always look under the News menu on our web page. If we do not have your email address, send it to info@petaustin.org and request to be put on our mailing list.